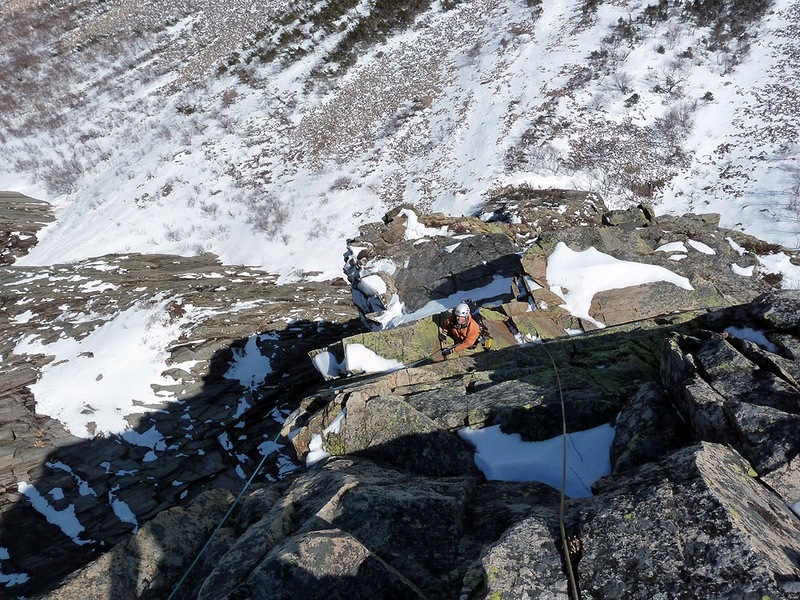 It seems fitting that my ice climbing should begin and end at Cannon this season. My rock climbing season just began there too. Omega is an ephemeral ice line, and one of the hardest "classic" lines in the northeast. It's also a rare former, and there's a good chance, if you have a regular 9-5 job you haven't done it. I'm one of the many who's never climbed it. When Omega comes in an attentive ice climber will drop whatever else they're doing and run for the cliff with the whole kitchen sink in tow, ready for anything. This season I was almost attentive enough to be there in time. Last week, after one of those torrential cold rainstorms, where the temperature hovered near freezing the whole time, things froze in a hurry. Several lines on Cannon that have never come in before, and may never come in again formed. I was busy. Then it rained again. This second rainstorm, late last week, most likely had a net negative impact on things, even though it was a similar weather event to the prior rainstorm. The forecast last week made this past Tuesday seem like the day to go though. Michael and I made tentative plans for Tuesday and went about our our own businesses. By Sunday things were looking a bit warmer for Tuesday. Even though Monday was now looking like the better day it was going to have to be Tuesday. I was tired from a weekend of guiding and too much driving. It's funny, just when you think you understand mountain weather you realize you don't know much at all. Michael and I met at the parking area at 6 a.m. just as it was getting light out. We packed our kits for the day and headed off up the hill. 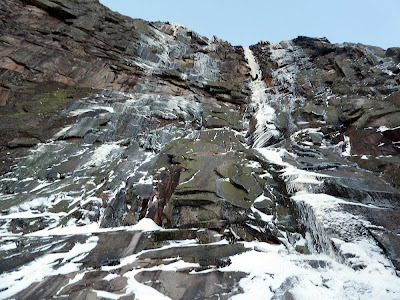 As we rounded the buttress below Omega we were greeted by top-to-bottom ice. 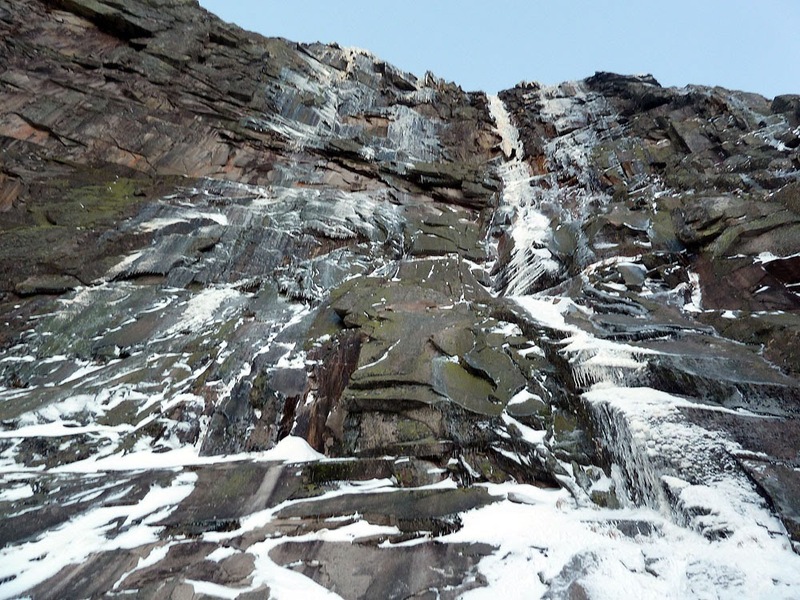 The lowest 100 feet of ice was little more than snow stuck to the rock and held in place by a bit of ice. It was easy to bypass this section via the rock buttress on the right. We were at the base of the "real" climbing shortly. It was then that the sun finally rounded the hillside across the notch and began to heat things up. I started up the pitch in the blazing morning sunlight. The high was forecasted to be 26 but it was already much warmer in the sun. Water began to run almost immediately and a barrage of small icicles from above began to rain down. After a few tries I coaxed myself through some initial rock bulges (M5-ish and way R-rated - I didn't have a full selection of pins for the job) and stepped left to the ice. I clipped a ratty pin nest and continued up rotten but climbable ice. Higher I placed two half driven 10cm screws and topped the bulge out. Another ratty gear anchor beefed up with a cam provided a nice respite from the scary climbing below. The ice was pretty rotten and already a bit delaminated. Michael followed the pitch quickly but the sun's effect was ultimately too strong for our liking. If there's one thing I've learned from experiences at the Catskills and Lake Willoughby this season it is that weakly supported ice can stick around a long time. All it takes is a little human touch to bring it all down. We decided to rappel before anything really spooky happened. Safely back on the ground Michael and I began coiling the ropes to head over towards the Black Dike and Whitney Gilman. Halfway through our coil job a large portion of one of the climbs above (Line of Fire and Firing Line, I think) collapsed and sent us running for shelter. By this time only an hour or so after sunrise many of the smears in the Big Wall section had already disappeared. Michael, exercising good judgment, suggested we use the warm sunlight to our advantage and take a lap on the Whitney-Gilman Ridge. 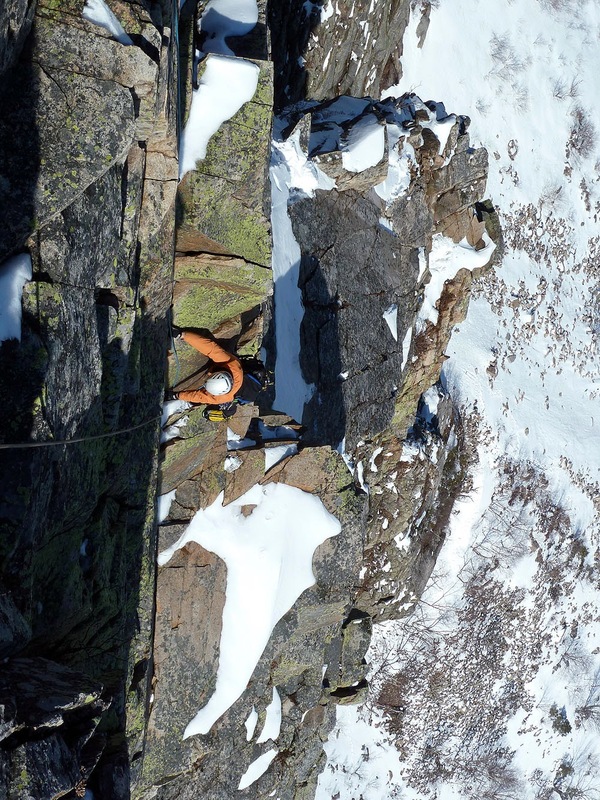 I'd almost forgotten how much more laid back rock climbing is than ice climbing. 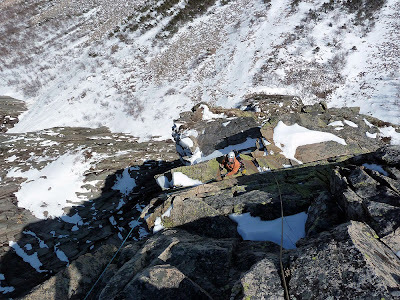 The climbing, dry rock with occasional patches of snow and ice on the ledges, was more reminiscent of early summer alpine climbing in the Cascades or Alaska than New Hampshire. 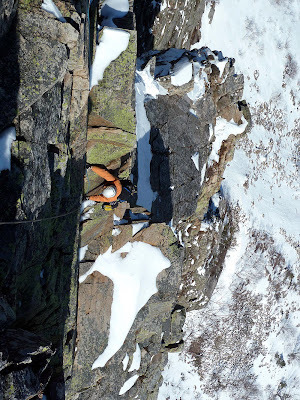 Warm rock and strong direct sunlight even allowed us to climb without gloves for most of the way. A few hours later we topped out and were surprised to find that the trail off the top wasn't even packed. 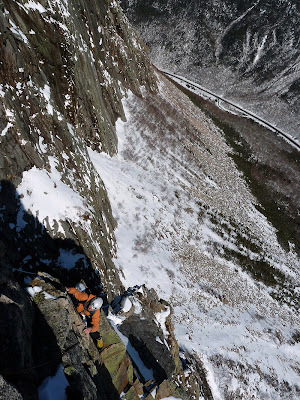 I guess a lack of ice at Cannon for most of the winter has kept climbers away. The trail, or lack thereof, was a good reminder that spring isn't totally here yet. We felt like moose trying to walk through inconsistent snow. He's up and walking. Now he's down. Up... and down. Still it was pleasant to be outside enjoying the sun and knowing that we were safe, sound and headed for coffee, beer and food. With the exception of a few more guided days up in the ravines on Mt. Washington I'm going to be shelving my gear for the season. 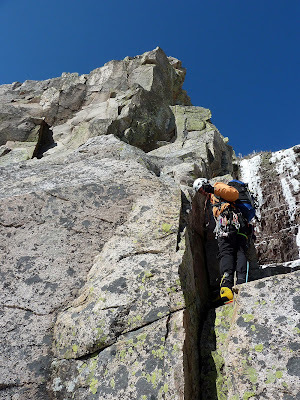 While I'm sad to see such a prolific season go I'm also excited for warm weather, rock climbing, and working on some of the website projects I've put on hold. Winter is so fleeting and such an awful time to waste.